Carton Edge was established in 1991 and initially serviced the cling film and foil dispenser carton market. During subsequent years we have consistently developed our processes. Housing 13 carton finishing machines in our 14,000 square foot facility, our experienced operatives cover two shift patterns to ensure our production team are capable of quick-turnaround carton finishing production. Carton Edge are your manufacturing partner, taking pride in exceptional standards of innovation, service and experience. We were the first UK finishing house to hold full BRC-IOP Hygiene accreditation, necessary for the manufacture of food safe packaging, operated in conjunction with ISO 9001-2000, leading innovative production and our own Continuous Improvement Policy. This should make Carton Edge your first choice for Food Safe Quality Finishing. Carton Edge is located in a purpose built factory that is conveniently situated at the heart of the national motorway network, and within 10 minutes from Birmingham's NEC, LG Arena and International Airport and Railway networks. By installing a Shuttleworth MIS System, Carton Edge can monitor all operations, control costs and direct labour between machines so as to meet your expectations for quality, budget and deadlines. Our in-house capabilities cover an extensive range of packaging material, including coated boards and high-density corrugated and plastics. We are happy to advise the various finishing applications with you suited to your requirements. Printers new to carton manufacture can liaise with us to ensure the cartons are designed to minimise board consumption while offering optimum fit for purpose. We have two machines that can apply flexible (polyester, acetate or preferred material) windows and bags from a reel to a carton. Recent investment has doubled our Pick & Place capacity for applying rigid windows and other applications. These ready erected packs have tapered sides so as to nest into each other. Examples would be clamshell "burger boxes", chip scoops or carton trays. Over labelling can apply promotional text or rectification of cartons that require amendment. Labelling can be applied to clear plastic cartons to provide that personal touch to your packaging product. Yes, this is from where we originated our Name! For food preparation products, foil and cling film, the edging process applies a serrated edge to your printed carton. This finishing technique can be coupled with our gluing facility to complete your packaging product. See below for our new line, Crystal Edge Cartons. All Fefco Designs considered. Contact us for further information on folding plastic packaging. If you require something a bit different, let us know, we like a challenge! Carton Edge have recently introduced a new service line, expanding the finishing processes to include folding Plastic Packaging, by the installation of the latest in Die Cutting machinery and expertise. The Brausse 1050SE Die Cutting machine with heated bed allows for Carton Edge to provide a quality Cut and Crease service, among many other plastic packaging solutions, efficiently created to suit market production needs. This new line has prompted new branding for Carton Edge, and the name Crystal Edge Cartons will incorporate all aspects of plastic folding carton production. 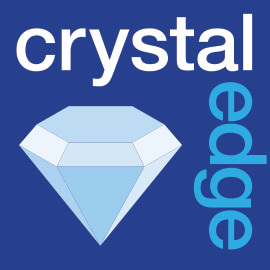 Crystal Edge is now able to offer this service to include a range of materials, such as Rpet, Apet, PP and PVC. With the PUR Gluing processes already in-house, Crystal Edge are now able to offer a complete solution for your plastic carton requirements.